Treat yourself to a rare delight. The voluminous raspberry bouquet will greet you long before your lips touch your glass. 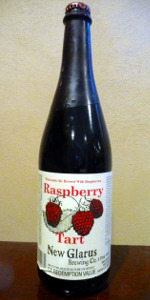 Serve this Wisconsin framboise very cold in a champagne flute. Then hold your glass to a light and enjoy the jewel-like sparkle of a very special ale. Oregon proudly shares their harvest of mouth watering berries, which we ferment spontaneously in large oak vats. Then we employ Wisconsin farmed wheat and year old Hallertau hops to round out this extravaganza of flavor. A - Pours a light blood colored red with strawberry shortcake looking two finger foam head. A thing of beauty! S - Tart raspberries as you'd expect. Some fruity esters in there as well. T - Tart raspberry and cherry. M - Light and effervescent. High carbonation. O - A beautiful light fruity beer. Great example of this style. Perfect light dessert beer. Bottle received in a trade recently. Pours a gorgeous dark red color, with a one inch head, and no lacing. Smells just outstanding, big bouquet of raspberries, some slight tartness, and just the tiniest bit of oak. This has to be the most authentic fruit flavor I've ever gotten in a beer. This one is intensely sweet, cut by by a slight, but very welcoming tartness, some oak, etc. I get both raspberries and raspberry juice. With the lower ABV, there is no alcohol feeling whatsoever. It's almost wine-like, and barely feels like beer. No malt flavor that I can detect, just a huge expression of my favorite fruit. This one is light bodied, with a slightly-higher-than-I'd like amount of carbonation. It's got a fizzy, crisp mouthfeel. An outstanding achievement here. It's barely beer, but it tastes so good that I don't care. Pours a dark red with a small pink head on top. Just a vibrant, lovely color here. As I swirl my glass I get some good stringy lacing on the sides. Whoa! My first sniff brings huge fresh, ripe raspberries...like a fresh made jam from fruit just picked from the garden. A hint of wheaty maltiness is hiding in the background along with a touch of spiciness. First sip is a wash of sweet/sour raspberry goodness. The pale/wheaty malt background gives it a bit more of a beer feel to it. However..this is all about the huge raspberry flavor..fruit beer on steroids. A slight mellow spiciness on the back of the palate rounds it out. Quite acidic overall and slightly puckering. Raspberry beer is quite yummy. There is a good medium body that has a syrupy consistency to it. Goes down smoothly. An interesting beer for sure. Not one I could see myself drinking much of...but a good change of pace. I can see how this could be a love it or hate it affair. I'd say it's definetly worth seeking out...especially if you're a fan of fruit beers. Cheers to New Glarus and I'm glad I have another 750. For my 500th review (Woo Hoo! ), I figured I would do something special. Thanks go out to nflmvp for this one. Comes in a 1pint 9oz bottle with the cap dipped in red wax and oozing down the side of the bottle. The bottle literature proclaims this a "rare delight". We shall see. Pours into a pint glass a murky cranberry color with a nice, fizzy, soda like head that is more of a strawberry color. The bouquet on this is unbelievable. Tons and tons of raspberries. Possibly even some strawberry and sour cherry tossed into the mix. Basically, any red fruit, with the full emphasis on raspberry. I have never smelled something so pungent and tart and delicious. The flavor is unbelievable as well. Perfrect amount of tartness from the raspberries with just the right amount of sweetness to balance things out. I honestly could drink this all day every day and I would find it impossible for anyone not to like this. ABV is nonexistent. This is truly a beer to behold. Thanks again nflmvp and glad this was number 500! Honestly, I don't understand the rave reviews for this beer. The aroma lends a bit of funk and complexity but, as a whole, it drinks like an intensely sweet Framboise, even by St. Louis and Lindeman's standards. Syrupy mouthfeel that gets worse as it warms. Only recommended for those who like things on the border of sickly sweet. Luckily, I can stand it, since I like sweet stuff. After reading all of the reviews, I was expecting amazingness. This beer just didn't do it for me. It was so incredibly sweet, and not in a good way.... it burned the back of my throat. There was absolutely nothing to balance out the sweetness either.... this was as sweet as Sunny Delight, and I can't stand Sunny Delight. Enjoyed over the summer, during a lazy trip through Wisconsin, review is from notes. Large green bottle with that classy waxed top. Bottle shows no freshness or vintage dating. Pours dark amber, with a short lived head and only minor lacing to be observed. Fruity, smoky and SOUR nose. Pleasingly tart brew, not for everybody, but to my taste buds this stuff makes a fine desert brew for those of us into this type of creation. Rich raspberry notes. Tasty and well worth seeking out if in the Wisc. general area. Strawberry foam, bubbles like a honey comb, the beer is the color & density of fruit preserves. Even as the head vanishes, the surface looks a bit uneven. It wobbles a little like half stiff Jello. I put the butter knife & English muffin away & get to work. An intense shot of strawberry & raspberry Smuckers gurgles up the back of my sinuses. Actually it smells more like the poor man's Chambord, Chateau Monet. :P Seems just a little bit stronger then 4% should. There's a little stiffness on those full breaths I'm taking. Loads of sugar. You can just smell the Domino truck parked on the corner getting sticky in the hot afternoon sun. Tart upfront with a slight bitter rind, a good amount of acidity, a strong spritz of carbonation, & a very mild grain finish. Almost like soda, but so much fuller. The sugar isn't overwhelming at any point, & isn't really the focus. It could of actually used a touch more sweetness, but maybe that's just what I'm in the mood for right now. Poured from a 25 oz bottle into a tulip. Appears a dark red color with a good off-white head. Leaves good lacing and has good retention. Looks great. Nose is full of raspberry, other sweet fruits, caramel, brown sugar and just straight around sweetness. Taste is straight sweetness. Lots of sweet fruit, but specifically raspberry, as expected. Finishes tart. All works together very well. Mouthfeel is medium-bodied, good carbonation levels and leaves a slight film on the inside of your mouth. This is crazy drinkable, as expected by the low ABV. Everything goes down so easily. Overall, this is a wonderful brew. Haven't had many fruit beers, but this blows me away. I've heard all the hype and tried to go in unbiased, but still was amazed. Definitely worth seeking out. In the Texas heat during August, I usually want something really light and something with fruity flavors. Thanks to my friend, Aaron, I had an opportunity to taste this gem. It's a welcome respite from all of the summer beers I've tasted in the past. The appearance looked very dark for what it is, so it sure didn't look that light.The smell of this beer isn't as fragrant as I would thought a fruit beer would have, however smelling aroma from the beers isn't my forte. The taste and mouthfeel of this beer is excellent. I certainly loved the taste of this beer because it isn't overly sweet like some of the other fruit beers I've tasted over the years. It's certainly not as sweet as Lindeman's Framboise. Drinkability's great if you want something fruity without the excess sweetness. A rush of raspberry aroma gushes out the moment you open the bottle. Pours a lovely, almost blood-like, dark red. The aroma is almost intoxicating in a good way. Taste is wonderful. SO much raspberry and just the right bit of tartness. It's balanced by a nice sweetness as well. Finishes dry and sweet. Carbonation is just right. Isn't as tart as say, a lindemanns framboise and that's a good thing. Very drinkable. Great as a dessert beer.